We've been working the last few weeks on time. One thing my students really like in math is the "I Spy" games, where they have to roam around the room searching for their math problems. They like the "hunt" of finding them hidden all around the room. 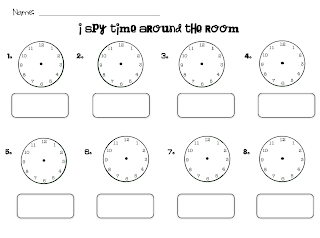 In our time unit, I didn't have an "I Spy" game that was to the quarter hour, half hour, and o'clock. So, I created one! I can't wait to try it out! 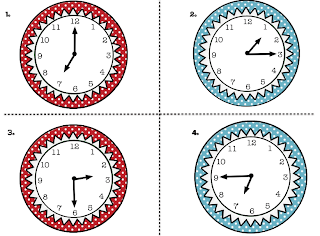 In this unit, there are 16 different clocks and a student recording sheet. 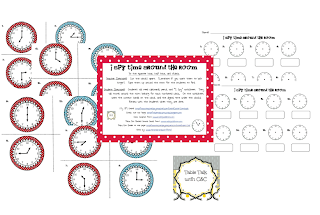 This activity can be used whole class, small group, or as a center activity. You can find this unit in My TPT Store or by clicking on any of the images above.